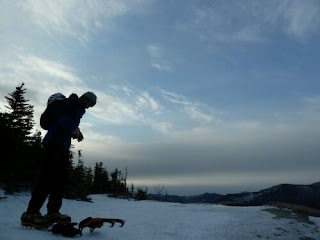 I'm in New Hampshire right now and I had a little taste of this thing the 9-5 crowd calls Dawn Patrol. I'm sure I'll be moving more slowly while guiding today, and I don't think my partner for the day will mind that. 6:27 a.m. - Leave car. 7:00 - put crampons on below first bulge in Shoestring Gully. 7:26 - Top out via the rock chimney finish. 7:58 - Return to road and head to AMC Highland Center for another coffee before meeting my client for the day.